trial | Scuffalong: Genealogy. trial – Scuffalong: Genealogy. So, the conversation started with talk of Bill Bailey’s barbecue joint. Which was also a dance hall. Which, though it was right up the road, was, as my grandmother put it, “strictly off-limits” to her and her sisters. “We couldn’t stand him,” she said, because “he did everything illegal and got away with it.” He had a great big stomach and was “trashy,” but his steaks pulled the best of Iredell County’s partying white folks. And he was married to my grandmother’s Aunt Bert. Me: Now, she wound up … She shot somebody, or something, didn’t she? My grandmother: Yeah, she shot somebody. She shot a white man. My mother’s first cousin, N.: What he do? Slap her? What did he do? He did something to her. My grandmother: I don’t know what he did to her. But maybe … seems like to me he kicked her. N: And she shot him. My grandmother: And she shot him. N.: They had to take his leg off. Me: Oh. Well, good for Bert. James Warren, Merchant Marine Home on Leave, Seriously Shot. Mae Bailey, Colored, Held in County Jail Charged with Shooting. 29 March. Warren Holding Own, But Will Not Be Out of Danger For Week. 30 March. James Warren’s Leg Amputated. 3 April. James L. Warren Is Better But Not Yet Out of Danger. 6 Apr. Mae Bailey Freed from Jail Today, Hearing May 8th. 11 April. May Postpone Murdock Trial. 29 April. Warren Removed to the Naval Hospital at Portsmouth, Va. 1 May. M. Murdock Trial Postponed Until Monday, June 12. 8 May. James Warren Starts Civil Action Against Murdocks for $25,000. 11 May. Mae Murdock Case Continued to August. 25 May. Judge Bobbitt to Superior Court Preside August, Case of Mae (Bailey) Murdock Will Not Be Tried At This Term. 29 July 1944. Murdock Trial Definitely Set For November 6, Warren is Able to Leave Hospital. 6 September. Prosecuting Witness May Not Visit Scene of Shooting. 9 October. Mae Murdock is Bound to Court Under $5000 Bond. 16 October. Case Hinges on Warren’s Action Before Shooting, Testimony Rapidly Nearing Completion. 9 November. Murdock Woman is Convicted. 13 November. Murdock Case to Go to State Supreme Court. 14 November. $25,000 Law Suit Against Murdock Woman Continued. 14 November. 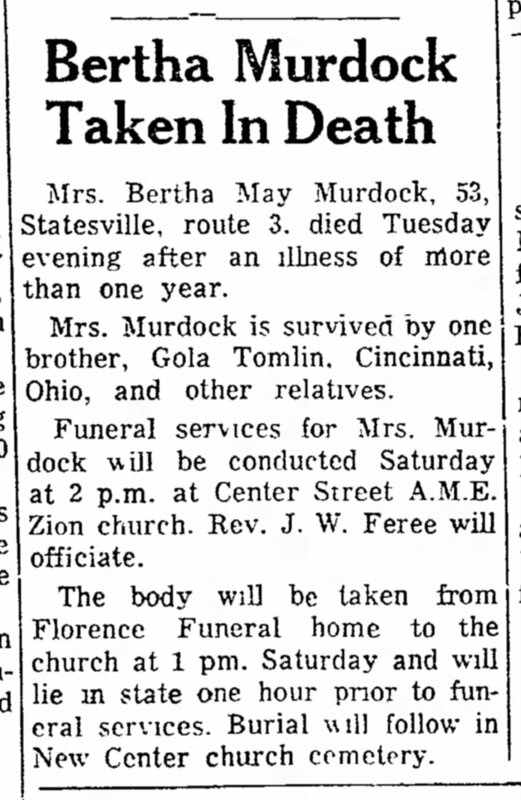 Aunt Bert served her time at the state women’s prison in Raleigh and returned to Statesville after to pass her few remaining years. She had possessed considerable wealth after her father’s death in 1929, but lost much of it while she was away. My family maintains that William “Bill Bailey” Murdock had entrusted whites to help hide his shady assets, and they betrayed him after Bert shot one of their own. Bert died in 1955. The Landmark ran her death notice without comment or reference to the incident for which she had been infamous just ten years earlier.